Available Now ! Click Here to Order ! Never to be repeated ! over 4 hours of incredible music never before released ! A set of 5 CDs, recorded live at Zigzag magazine's fifth anniversary concert, held at The Roundhouse on Sunday afternoon and evening, 28 April 1974, complete with a 32 page booklet celebrating the occasion. 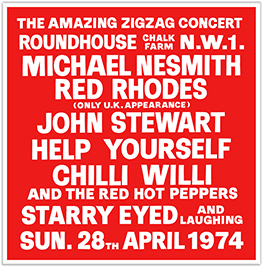 In 1974, Zigzag, the UK's first monthly rock magazine - much imitated but never surpassed - became five years old, and to celebrate this auspicious landmark the magazine's founders Pete Frame and John Tobler organised a concert at London's Roundhouse. And not just any old concert. This momentous occasion, indelibly engraved in the memories of all who attended, featured a choice sample of Zigzag's favourite bands and artists: STARRY EYED & LAUGHING, CHILLI WILLI & THE RED HOT PEPPERS, HELP YOURSELF, JOHN STEWART with ARNIE MOORE & PETE THOMAS and, topping the bill, MICHAEL NESMITH with RED RHODES. Not surprisingly it was a day of peerless music, which, thankfully, was all faithfully recorded. Stored away and largely forgotten for nigh on thirty-six years, those dusty and flaking tapes have now been unearthed and their sound quality transformed by a process akin to alchemy into nuggets of audio and artistic perfection.